A team is a group of individuals working together. Tango and Cash, for instance, were just a couple of supercops who liked to work alone; one had a refined style and the other was a little rough around the edges. When they were forced to work together, they were able to accomplish some pretty amazing things, including but not limited to, escaping a maximum security prison and taking down a criminal mastermind. My point is that these were no ordinary tandems – they were great. That’s because great teams are comprised of those with complimentary abilities (sometimes opposite) who combine forces to achieve a common goal. Just think of the incredibleness illustrated in seemingly polar opposite duos such as Gimli and Legolas (dwarf/elf), Kid ‘n Play (little hair/tall hair) or Hall and Oates (mustachioed/non-mustachioed). Another good example is C3PO and R2D2; a tall, uppitty robot with legs and a British accent paired with a short ‘n stubby robot with rollers who only communicated through beeps and whistles. By themselves pretty forgettable, but together… a part of history. So what happened to Favre and Childress? On paper you have a couple of guys who look different, talk different and definitely have differing abilities. One would think that their combined powers would leave them dominating for years, but Childress was fired and Favre is having a horrible year. For the purposes of academia, I turned to Dr. Google where I immediately discovered the root problem. As you can see, a simple query of each man’s name into the search engine reveals major overlapping themes: they are both idiot jerk douches. Science tells us that when there are too many like qualities, you cannot achieve harmony. It’s the perfect recipe that results in chaos or useless, homogeneous matter. 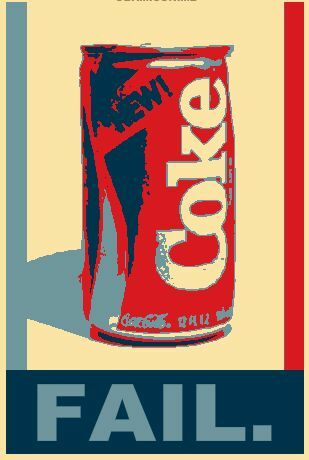 Just look at New Coke or the Olsen twins. Chalk it up to a failed experiment. Awesome. Always enjoy a good Kurt Russel reference. When I retire and start a consulting firm (as one does) specializing in conflict resolution I may need to steel, "great teams are comprised of those with complimentary abilities (sometimes opposite) who combine forces to achieve a common goal." Hard-hitting investigative journalism Greenfield! Maybe the Pack are so great because M.M. and T.T. are so different. One can eat no fat . . .
Soorjo, are you related to Albus Percival Wulfric Brian Dumbledore? No Sir. We are of no relation. I've wanted to put "mustachioed' in print for some time but just couldn't figure out how.